Extra Packaging provides Polyether and Polyester based TPU Film in the form of Roll stock and Bags. While the film and tubing we provide is environmentally friendly, it also offers a unique combination of mechanical, physical and chemical properties, such as flexibility, high tensile strength, excellent abrasion and weather resistance. It is also non-toxic, recyclable and decomposable. Our film can be bonded to a wide range of substrates by several different processing techniques, such as adhesive lamination, hot plate welding, high frequency sealing or sewing. Three-dimensional decorative effects can be accomplished by adhesion bonding the film to another substrate through ink printing, vacuum forming or high frequency forming. Extra Packaging's polyether and polyurethane bags offer flexible packaging solutions for a variety of industrial needs. We are a leading military packaging supplier, providing polyurethane products for the US Navy which meet the SS507 spec. Our bio hazard bags and other poly-based waste transport products serve such markets as the shoe industry, recreation and sports equipment, medical devices, automotive, fabric laminations, garment applications, inflatable applications, and many more. We also offer green nuclear and black conductive bags. Tear strength is a physical property which measures the resistance of a notched test specimen to tear propagation. Tear strength is generally regarded as the critical indication of the physical strength to external force. In this respect, our film is superior to most other plastics. Our TPU Elastomers can withstand substantial physical abuse from scratching, friction and corrosion forced upon the surface of the materials. With over three times the durability of rubber, our film provides excellent abrasion resistance, and functions very well across a broad range of end-uses. 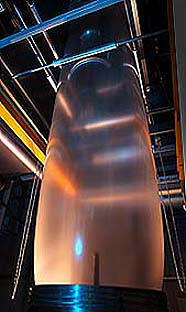 Flex-crack resistance is a property that is required when composite films are constantly under severe external forces. Our Polyurethane's have excellent dynamic flex-performance and are used in many demanding applications. At normal temperatures, our Polyurethanes have outstanding resistance to hydrolysis for 1-2 years without undergoing any changes or decomposition while maintaining their mechanical properties. Our Polyether grade demonstrates superior hydrolysis resistance when compared to other Polyester films. If Polyester based TPU film is exposed to warm water for six months, or very hot water for 3-4 days, it will irreversibly break down and decompose. As a result, the mechanical properties of the film will deteriorate. Therefore, our film is environmentally friendly for applications where constant contact with water is inevitable. The excellent resistance to greases and pure mineral oils (such as lubricating, fuel, and diesel oils) provided by our film make them well suited for many industrial and food contact applications. Our film does not react chemically to the oil contamination and usually results in higher tensile strength than the initial properties detected. While the response of other plastics materials to oil contamination appears to be poor, our film has once again proved to be superior to other plastics materials. However, in the case of contamination of water identified in mineral oils, the reduction in TPU film physical properties is inevitable. Plastics are chemically degraded by the effect of UV-radiation and heat. For outdoor applications, weather-ability is an important aspect in material selection. For use at high temperatures, various grades are available that provide additional protection against degradation, oxidizing or aging. Our film can be used over a wide range of temperatures and our Polyester grades can withstand much higher temperatures then Polyether grades. Our film can withstand temperatures as low as -60 degrees Fahrenheit, while mechanical and physical properties are still maintained. Most importantly, our film will not become brittle and is excellent for applications that require superior low temperature flexibility. It is also an excellent replacement for PVC. Our film is widely used for inflatable products where the diffusion coefficient is critical. The diffusion coefficient factor specifies the volume of gas that will pass through a test specimen of known surface area and thickness in a fixed time, with a given partial pressure difference. The diffusion coefficient varies to certain extent depending on the type of gas in questions. Generally speaking, Polyester grade has a superior gas permeability to Polyether grade. Our film is biocompatible and non-allergenic while maintaining its characteristics during sterilization. Our film is widely utilized in medical applications, sanitary products, sporting goods and protective devices.